Welcome to Accent Woodworking Inc.
For over 20 years, Accent Woodworking Inc. has been making standard and custom pieces for both residential and commercial properties throughout Florida. We pride ourselves on using local American-made lumber to create high quality products with various wood species. At Accent Woodworking Inc., we build and design kitchen cabinets, bathroom vanities, laundry room cabinets, custom built-ins, Murphy BEDS, home office furniture, entertainment centers & much more! Have your own ideas? Help us help you bring your design to life and with customizable pieces based on your space, style, and budget! Send Us Your Ideas Or Schedule a Consultation Today! 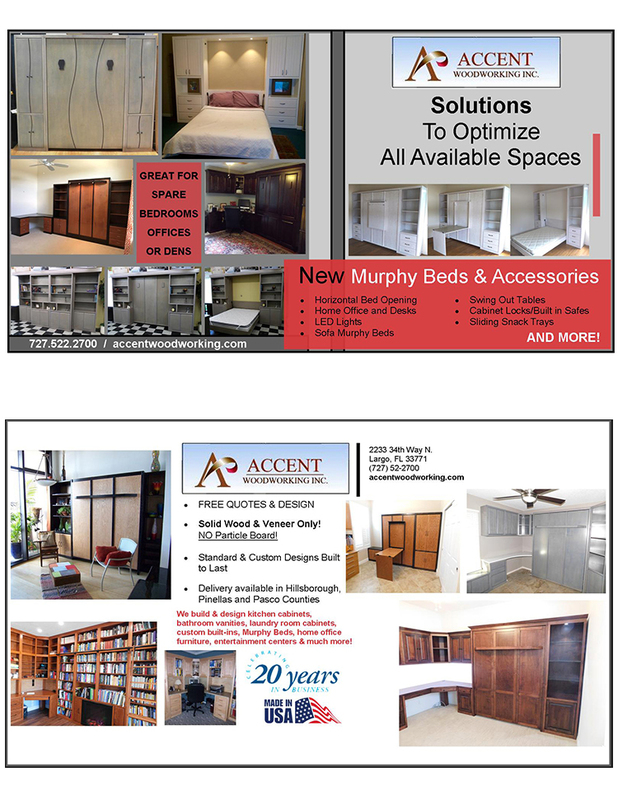 Here at Accent, we build Murphy Beds, home office furniture, entertainment/media rooms, custom built-in, closet organizer systems and much more. We also custom design kitchen cabinets, bathroom vanities, laundry room cabinets. There’s nothing like the look and feel of real solid wood furniture & cabinetry, which is why we use only solid wood (oak or maple hardwoods and plywood veneers) to produce high quality furniture for your home or office. The craftsmanship and flawless finish of our custom built wood furniture & cabinetry is second to none. Trust the details to us! All of our furniture and cabinets are built in-house and do not contain particle board. Our promise is to give customers the attention and care they deserve in order to fulfill their needs and make their dream designs into a reality. We offer delivery and setup to all homes and businesses in Central Florida. We are passionate about building beautiful pieces to withstand the test of time which fits within your budget. We are masters of detail throughout every stage from drafting sketches to installing our pieces in your homes. We specialize in using Oak and Maple Hardwoods, Plywood Veneers and craft our pieces in Traditional, Shaker, Modern and Contemporary styles. Our unique lines can match any taste, and we offer a wide variety of over 10 standard finishes as well as custom matching to add the perfect final touch of shine and beauty. We work with residential clients, designers and builders to create our dual purpose space-saving furniture and cabinetry. Custom designs are our specialty. Whether your design or ours, we make quality products that stand the test of time and look beautiful for generations. Many of our customers choose from one of our standard made-to-order products, like a Murphy Wall Bed or an entertainment center, which we can customize as well to meet your needs. To view our full product line, please visit our photo gallery. You may prefer a custom one-of-a-kind design that uniquely expresses your style. Bring your ideas to the consultation, and we will bring them to life in your choice of real woods. Here you won’t find sneaky sales tricks, as our goal is to bring your vision to life, not make a quick sale. We have built our business on referrals and word-of-mouth recommendations, and our goal is for our customers to be as excited as we are with the custom design furniture or cabinetry we build for you and that you’ll share with your family and friends! During your free consultation, we take the time to go over all the options available for your new furniture. The small and large customizations are what bring the piece to life. It also serves to showcase your personal style. Our custom made furniture will bring new life and warmth to your home that you can enjoy for years to come. We design, deliver and install custom made wood Furniture and Cabinetry in all of Central Florida Areas Including - St Petersburg, Tampa, or any city in Pinellas, Hillsborough, Manatee or Pasco County. Call us today!